A simple and effective method for draining water within clay slopes and behind retaining walls. A length of Mebradrain is attached to a Duckbill Anchor using a D-shackle and hose clamps that are protected by a sacrificial, protective, polyester sleeve. 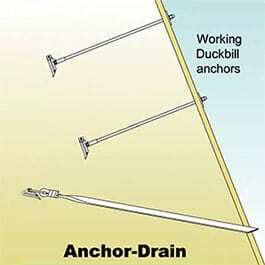 The Duckbill Anchor is driven into the earth and the Anchor-Drain is towed into position to the required depth. Excess water in the earth then seeps into the Anchor Drain and flows out of the end.